"New teachers MUST, MUST, MUST come to us with the ability to differentiate instruction for diverse learners. That is sorely lacking among new grads. I'm dubious about alternative certification programs, though I WISH they worked. Too many who come to the profession through alternative routes have NOT mastered the art of actually teaching, though they bring terrific content knowledge and life experience." Those of us who operate outside of the classroom are allowed to forget the fact that there's a difference between knowing something and teaching something. We also are allowed to forget that young people do not all learn in the same way. Those in K-12 education are not allowed to forget these facts, as Margaret's comment shows. A strong teacher is one who can adapt the lesson plan to the strengths and weaknesses of students' learning skills. And a strong teacher is someone with a grip on the material AND an ability to transmit it. If we all take a moment to remember our own days in school, I'm sure everyone will recall a teacher who had an impressive mastery of the factual content, but a less-than-stellar ability to engage students or transmit the knowledge. That's the point Margaret is making on alternative certification. It's one thing if a retired chemist is willing to lead a chemistry classroom in a local school. Said chemist, however, must be able to engage the students, too. While I have experience teaching in a college classroom, I have not had the responsibility to lead a K-12 classroom. What I have seen in visiting a class or speaking before one is that we adults vastly underestimate the challenge of keeping young people's attention on the task at hand. In short: Quality teaching is tough. It continually amazes me that so many citizens are afflicted with amnesia when it comes to addressing teacher quality and school performance generally. First, citizens forget that learning requires time. Check out what's expected of schoolchildren today in academics. We are asking them to learn more than we did at the same point in our schooling, yet we barely blink when we are told that children are spending less time in class, not more. My standing and simple equation to school reform is this: Spend more time in school. More time invested in learning means more learning. Second, citizens who themselves build their lives around the motivation of money (Anyone working for free right now?) act as if teachers are supposed to do whatever it takes at whatever pay rate ends up being convenient for taxpayers. If you want more talent in any endeavor in our culture, you better be ready to spend more money to get it. Third, citizens have forgotten how the field of education used to enjoy an advantage created by social restrictions on women. Most fields were closed or hostile to women, regardless of ability, prior to the 1970s. This created an artificial amount of talent in education -- a field open to women. Once we started moving away from the restrictions, the talent spread into other fields. In other words, teaching now looks more like any other professional endeavor in our economy -- though vestiges of the past remain. Money isn't the only issue when trying to attract talent to teaching. But if you are trying to ignore it or discount it, I've got some beachfront property in Gaylord to pitch you. And, yes, there have to be teachers who are ill-equipped in our schools and teachers who are just phoning it in. That's true in any field of endeavor -- just ask doctors. Maybe we should ask the doctors -- about why amnesia is so darned common around here. 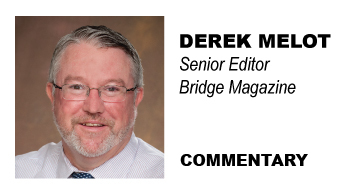 * Trimer-Hartley is a member of Bridge Magazine's Board of Advisers. Thank you for admirably articulating a mix of contemporary and historical references, related to the status of teacher quality and the (implied) need for consistent public $upport (vs. simply expecting/demanding it from teachers dealing w/fewer resources and more student contacts). How can differentiated instruction be an effective and rational expectation when an elementary teacher is dealing with thirty-plus students or a secondary teacher is seeing 180/day in six different classes (often being responsible for several different subjects/courses)? Several years ago, many (right to work/lower pay) states were lamenting a "teacher shortage" and benefitting from the "over supply" of teacher candidates from places like Michigan. "Economic realities" of recessionary times have altered this reality, and resultant collective bargaining (if not legislatively curtailed or negated) have witnessed requisite concessions to balance budgets in the face of reduced state per-pupil funding. Unfortunately, the history we're repeating is the reminder of how teachers are public servants, beholden to the "economy-related" capricious nature of taxpayers and their legislators.